Efforts to build stability in Yemen are being undermined by cuts in food rations to displaced persons throughout the country. The UN World Food Programme (WFP) is facing a funding shortage for its entire emergency operation in Yemen, which provides food aid to millions. WFP relies entirely on voluntary donations. In Southern Yemen, people are returning to their homes in Abyan province, trying to rebuild after the fighting between the government and Al Qaeda. The reduced rations will place an extra strain on these war victims. WFP needs US$33 million urgently to finance its displaced persons relief. Its overall Yemen relief program faces a US$170 million shortfall in funding. This includes distributing rations to food-insecure families and providing aid to malnourished children. The organisation also has a Food for Education program that needs to be expanded. Without funding, the threat of more ration cuts or even program suspensions loom. Half of the population in Yemen suffers from food insecurity and five million suffer from severe hunger. The hunger is most dangerous to children who, if they do not get the right nutrition, will suffer lasting physical and mental damage. If food ration cuts continue Yemen could easily see an increase in an already dire situation of child malnutrition. WFP, the largest food aid organization, is facing challenging relief missions around the globe, many of which are short on funding. The war in Syria has created a growing humanitarian crisis that is also in desperate needs of resources. The US Food for Peace program, the largest single donor to WFP, is under the risk of cuts by the Congress. This will make it more difficult to fight hunger and build stability in Yemen and many other countries. 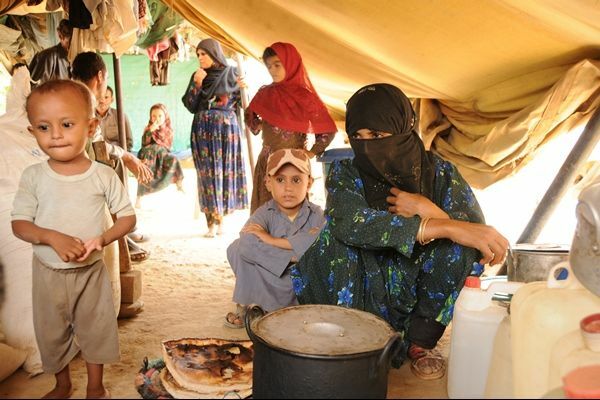 Article first published as Food Rations Reduced for Displaced Persons in Yemen on Blogcritics.